Recently GN delivered a new designed solidification unit to our domestic client, it has been improved based on the previous design with the bigger storage capacity for solidification agent, flushing system, stronger mixing unit for heavy duty operation. According to the feedback from the client’s rigsite, the storage capacity of chemicals is not big enough for drilling waste with more fluids, so the solidification agent storage box is bigger in the new design, so the new solidification unit could be used for multi drilling waste status- with more fluids content or with less. 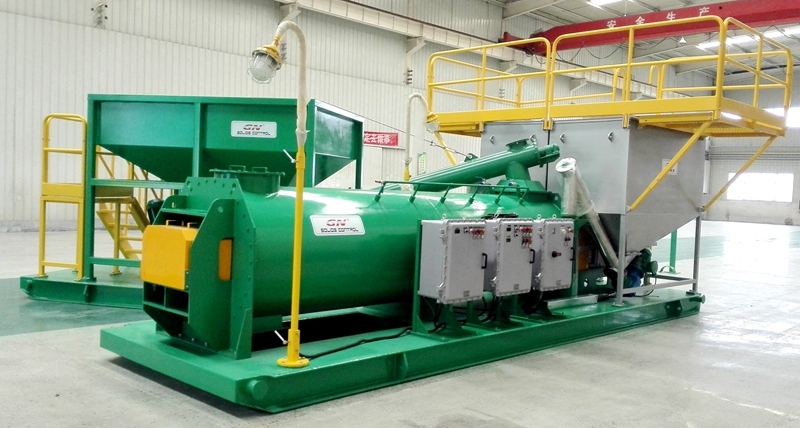 Another change on the new solidification unit is the feeding hopper skid, the feeding hopper is much bigger than the previous stabilization unit, we consider the international container shipment cost, the auger could be disassembly during shipment and the whole solidification unit could be shipped by a 40 ft container. Solidification unit is an economic way for drilling cuttings disposal when the fluids content is not too much, if the environmental laws is permit, but in some countries, solidification unit is not acceptable for environmental laws. Too much solidification agent cement and calc will be wasted and the cost will be higher compared with the performance. Except for solidification unit, GN solids control also provided drilling waste management system, Thermal Desorption Unit, dewatering unit, vacuum unit, Screw conveyor, decanter centrifuge, vertical cuttings dryer, high G dryer shaker, Mono pump, etc. Solidification unit and dewatering unit, decanter centrifuge and high G dryer is normally used for water based drilling cuttings, vertical cuttings dryer system is normally used for oil based drilling cuttings. We will keep improving our solidification unit according to the feedback of our clients, user friendly and the performance is our target to make our client satisfied. For more information of drilling cuttings disposal, pls contact with GN solids control.